I just received confirmation that the David Dunlap Observatory is shutting down tour operations. I expect this is the first step in the shutdown relating to the sale of the property. There is a brief window of opportunity for any groups remaining to see it and I wanted to get the word out. Any Scouting (and Guiding) groups from wishing to see the largest telescope in Canada have one last chance to visit. The staff can accommodate all age ranges from Beavers through to Rovers. But you must act fast to secure a spot. The following dates are available April 21, 23, 25, 27,28, and 29th. No tours will be run after April 30th. Group size is not important at this point. It can be 10 people to 70 people and can include family and friends. The fee is $5 per person. The minimum deposit is being waived. If you know of groups that could be interested, please pass the word. The 433rd Cubs recently visited the DDO and had a great time. Every good Scout should be able to find their direction. Even without a compass! Or a GPS unit. But how? How many ways are there to find north and south. It turns out there are a lot. Most methods that take advantage of basic astronomy that allow you to find true north and south. These are methods that could come handy in a survival situation. The picture above illustrates one of my favorites. It isn't taught as much because watches have gone digital and the method is seen by some as anachronistic because of this. The picture pokes a bit of fun at this because I borrowed a cellphone that had a "retro" watch face. The setup shown is northern hemisphere during standard time (it wasn't but it's just an example). The yellow line shows north. If you've become lost the simplest recommended method is the Hug a tree approach. This prevents you from getting further lost and facilitates rescue. Navigation methods like the ones described here are a bit more advanced. Nonetheless they are worth practicing! They won't easily help you find a small site like a camp, but wide things like highways and major rivers are another matter. This method is fast, portable, and reasonably accurate for these kinds of general methods. And even if you don't have an analog clock face, then you can draw one easily enough. It's not perfect (see below), but handy. Cast a shadow across the watch face. In the northern hemisphere, align the hour hand to the shadow. You will now need to bisect an angle (find the halfway angle) between the hour hand and noon (or 1pm if you are on daylight savings time). The line running through the bisected angle will run true north-south. North will be the side of the line closest to 3 o'clock in the morning and 9 o'clock in the afternoon. In the southern hemisphere the approach is almost identical (it would be if you had a clock that runs anti-clockwise). In the southern hemisphere align noon (or 1pm if you are on daylight savings time) to the shadow. Bisect the angle to find the north-south line. North will be the side of the line before 12 in the morning and after 12 in the afternoon. If you're lucky enough to have a 24 hour analog watch face, you don't need to bisect the angles. Some drawbacks include that you can easily be off the width of a timezone which is typically an hour but can vary. Knowing if you are close to a timezone boundary will help with this. It's also not supposed to very good if you are either too close (under 20°) or too far (more than 70°) from the equator. There are several methods for using the Sun to find direction. Knowing that the Sun rises in the east and sets in the west. You can figure an east west line at sunrise or sunset. There will be some variation depending on the time of the year and length of day, but the Sun should be due east/west at 6 o'clock am/pm. Locating direction using stars can be accomplished by several methods. Use sticks to track the rise and set of different obvious stars. This is a method that was believed to be used by the ancient Egyptians to layout the pyramids. The line between the rise and set of a bright star should be an east-west line. Of course, this requires you stay put for a while. In the northern hemisphere, this is beneath the north star located by using the pointers in the big dipper. See the Astronomers badge. This is another approximate method. Basically, the phase of the Moon will tell you the location of the Sun. Additionally, if the Moon rises before the Sun sets it is trailing the Sun and the bright side will point approximately west. If the Moon rises after midnight it is leading the Sun and the bright side will point approximately east. Another interesting looking trick is described as a "finger of shadows" on a nearly full Moon to point due north. It can be found here. I may be wrong but, this sounds overly wordy and colourful. The previous trick got me thinking about a crescent Moon. The line between the tips of the crescent should run approximately north-south. This makes sense if you consider that the Moon orbits close to the ecliptic (within about 5°) and will be illuminated from north to south. Non-GPS software is available for a number of mobile phones and PDA's. I'm most familiar with Palm OS based tools, but I understand there are versions for other devices such as Windows mobile. Possibly the Blackberry and other devices? I'd love to see comments on recommendations. 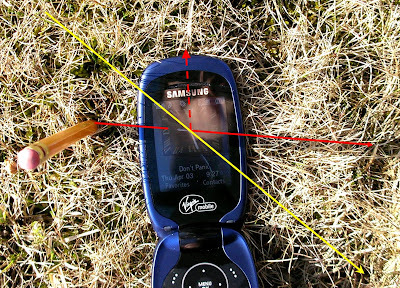 A number of Pocket PC and Palm "Sun compass" products can be found at PocketGear.com. Surveyors used very accurate Solar compasses because magnetic compasses could often be thrown off by deposits of magnetic minerals. A photo of one can be found here. I recently saw design for an unusual clock called the "Bulb Dial" clock, here. It's sort of a minimalist and Rowland_Emett-ish at the same time. (Emett is known for his wacky art-inventions that were featured in the movie Chitty Chitty Bang Bang and regularly displayed at the Ontario Science Centre in "The Magical Machines of Rowland Emett"). While I 'm not certain you can find north-south with it, a related find was instructions for a do it yourself Sextant using a CD case and Lego, here. (Careful about the sun filter). Earth dials are interesting and would make an interesting school or Scouting project. This Planetary Society article provides instructions on how to build one. For more information on these methods see this Wiki How To article. This covers many of the methods mentioned in more detail including using a digital SLR camera and a cell phone as well as the watch method, shadow stick, and star methods. Another explanation of the clock method with diagrams can be found here. Yet another explanation of several methods can be found here. The Planetary Society posted an article on Earth Dials (see below) with links that include a sites that calculates magnetic deviation for your locale and several links for teachers and kids including Astronomy with a Stick. Most people take browsers for granted and think of the browser wars as ancient history. Well they're back. Some of this diversity is a good thing. But the problems of security and compatibility lurk beneath the surface. Others (5%) including Konqueror, Camino, Netscape, Mozilla (pre firefox), and the ever popular blank or noname. I have yet to see a visit by a Flock user. Recently Apple has been trying to make a big splash with Safari. They got themselves into a bit of hot water by being aggressive and misleading using the iTunes updater to install Safari on Windows, here. And looked a bit silly because the click through license disallowed installs on Windows, here. Older browsers are vulnerable to all kinds of security problems and are actually unsafe on many pages. Unpatched security vulnerabilities make it possible for criminals to easily infect computers by planting malicious code on web sites and waiting users to visit. It's been called "drive by downloading". It's not just reserved for fake websites and spam blogs, many legitimate web sites have been laced with nasty malware. Security studies in 2005 and 2006 comparing IE with Firefox found that IE (v6) was unsafe 98% of the time! In fact, about 30% of our visitors are running unpatched browsers. About 20% of the visitors to this site are running the insecure IE v6! Also about 2.5% of visitors to this site are running insecure versions of Firefox. Of course, not all vulnerabilities are equal and if you want to do some research, vulnerability information can be found at Secunia.com as well as numerous other websites. Click on one of these links for a vulnerability summary for IE7, IE6, IE5.5, IE 5.0, Firefox 2, Firefox 1, Netscape 7, Camino, Opera 9, Opera 8, Safari 1, and Flock 1. Firefox can be supplemented by a variety of Add-ons which can improve both functionality and security. A few of my favorites are NoScript and Adblock Plus. Older browsers are also functionally problematic. It goes beyond not supporting newer web functionality, some of them don't follow standards and require web developers to go through all kinds of quirky hoops to get even simple web pages to display properly in all browsers. IE6 and earlier were notorious for being non-standard. Developers even have a name for one of the problems, it's called Quirks Mode. It's been argued that Microsoft likes this because it promotes their lock-in. Developers by and large hate it because it destroys interoperability and promotes lock-in. By way of example, when our web developer put together the "Forest Friends" page for the 433rd website the animals originally lined up properly only in IE. The site looked nasty in every other browser. Some experimentation and adjustment was required to get it working for standards based browsers like Firefox and Opera. If you look in the page source, you will see comments describing the gory details of how the page was adjusted. One web developer has been so miffed by these problems, he started a campaign called End6! to get rid of IE6 (and earlier) non-conforming browsers. This was picked up by another group, here, and caused some controversy, here. Just to be clear, he's not trying to get rid of IE. Just old non-conforming IE.